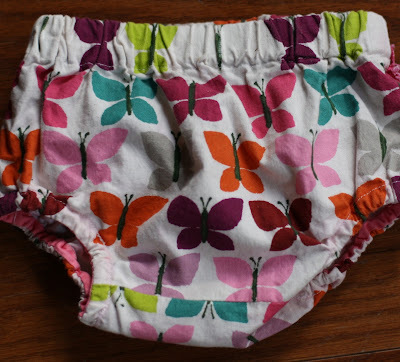 which were gifted to me when I was pregnant with Iris. Aren't they fun? The pinafore seemed like a good match. The tutorial was fantastic - a free PDF pattern that was easy to follow with good detail and great pictures. But the pinafore was way too big for the baby. I decided to try it on Evie as a tunic. She couldn't have been more thrilled. 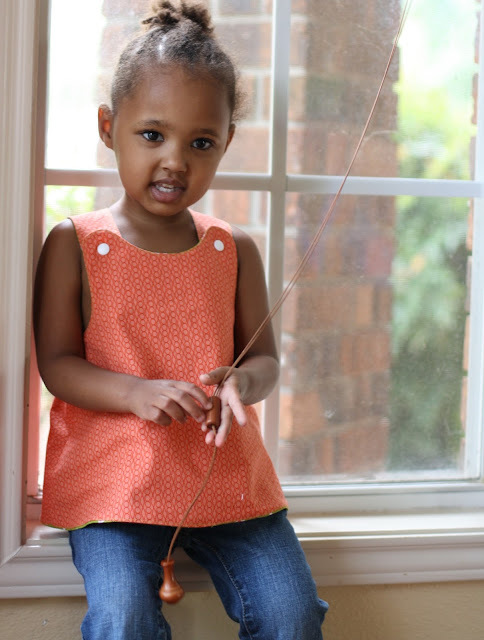 She's been asking me to sew for her but Indigo has declared a temporary moratorium on all sewing for Evie because Evie has "like 20 dresses and I've outgrown all of mine." It's true - the girl has a lot of dresses. 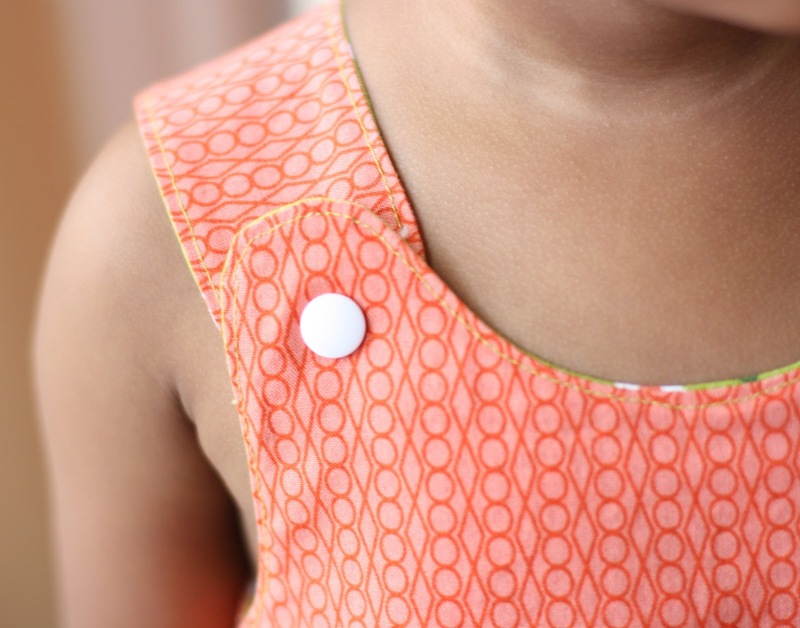 Inspired by this dress, I added snaps (instead of buttons) to make it reversible. It would be a shame to see such beautiful fabric mostly hidden as a lining. I only had a half of a yard for the lining, so I cut the straps perpendicular to the main fabric. I think it works. In the world of sewing, things don't always work out like we initially envision. It's always great when a project is still salvageable. Just like life, everything goes better when we're flexible. Love the pinafore. So pretty. She couldn't be more adorable. And the tunic is lovely. that's adorable. great photos, too. lovely! 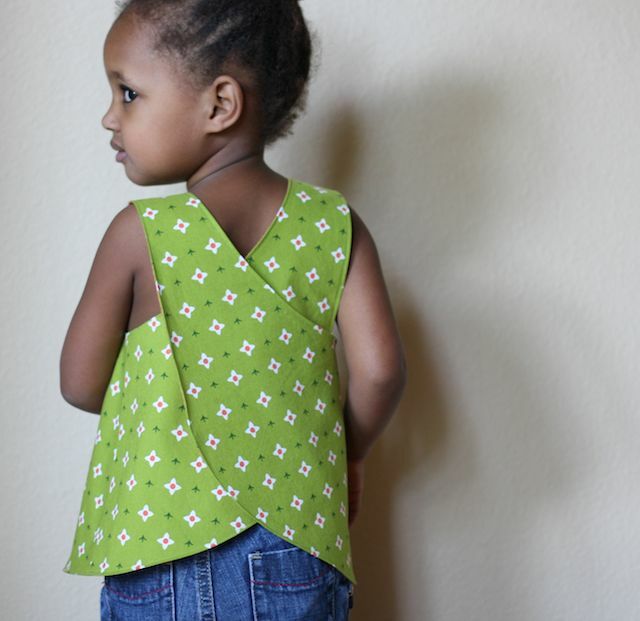 oh wow, i love this - and i love that you made it reversible! This is so beautiful! Thank you for sharing your ideas...if there's time, tomorrow I'll copy it! 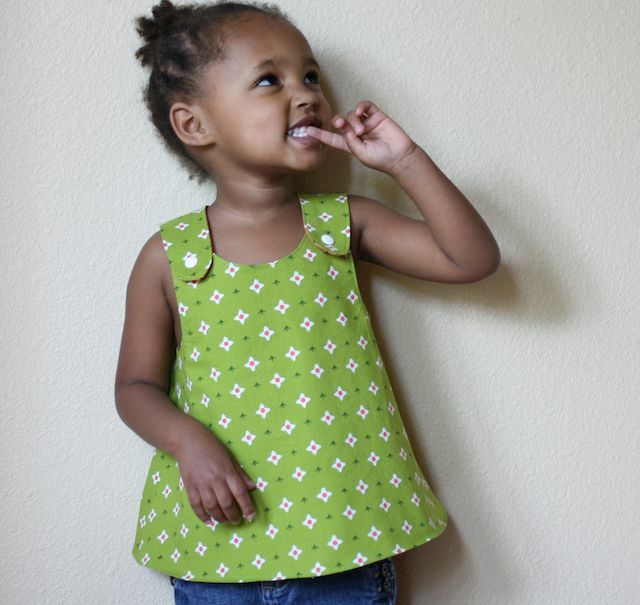 Beautiful little top for a beautiful little girl. I love your fabric choices. 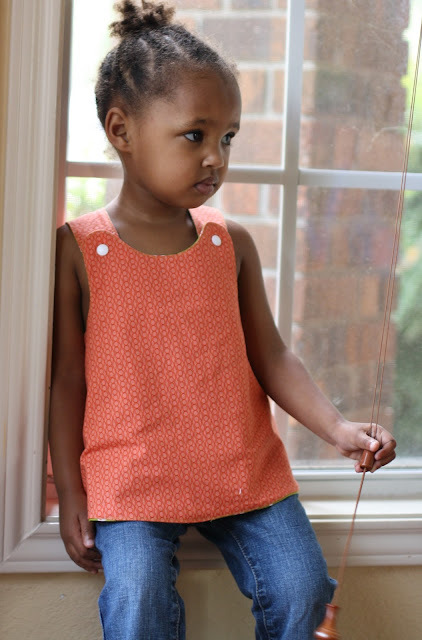 I followed a link from the KCWC Flickr group here because I loved this pinafore, and have really enjoyed discovering your blog. I'm going to try out some of your cooking links soon. suzy, thanks so much for stopping by and for the comment! Did you enlarge the pattern? If so how much? Susan, I did not enlarge the pattern. I had intended to make this for our (at the time) baby. It was way too big for her, but fit our (at the time) 3 year old daughter. 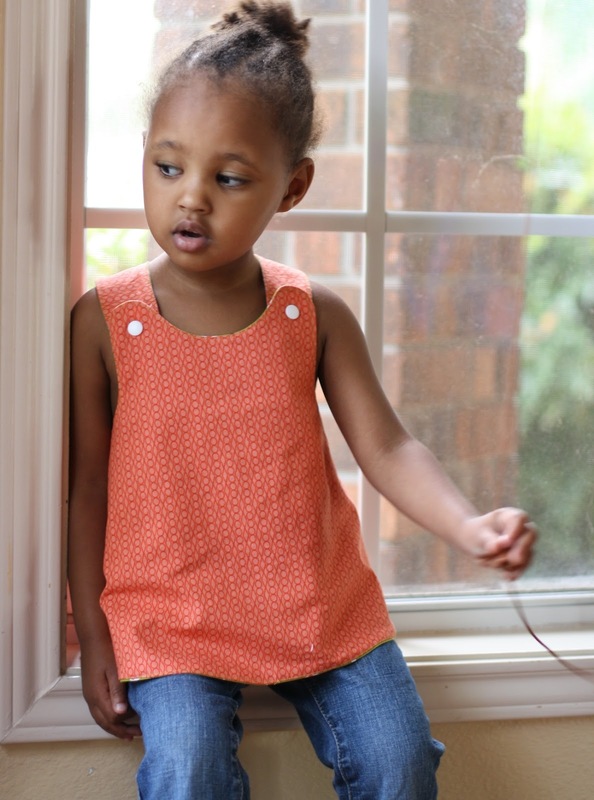 If you are planning on making it for a older child, you might want to add some length, as our 3 year old wore this as a tunic and it didn't fit for very long, even as that. 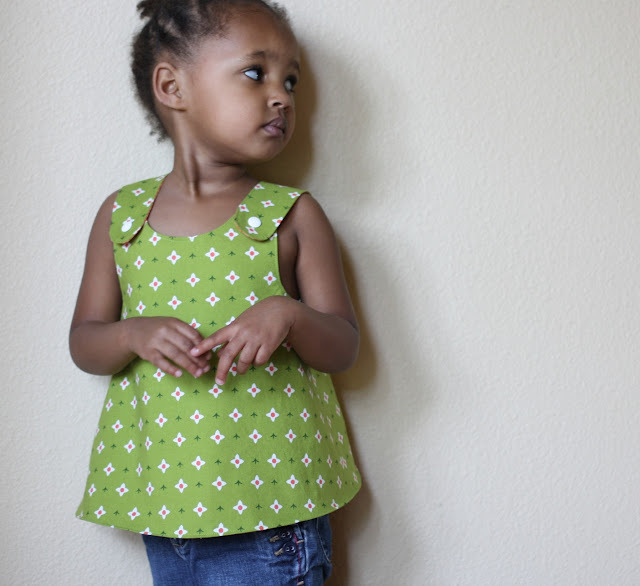 Hi Rachel, I'm thinking of sewing this tunic for my 2 years old daughter. Did you use the 12 months pattern for your beautiful realisation ?